Well, not at all actually. 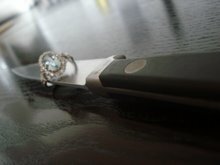 I was approached by yet another production company that wants to make a reality show focused on the glamour and intrigue of women married to chefs. The only thing is, they don't want wives married to famous chefs- so Mrs. Batali and Mrs. Vongerichten need not apply. They want women married to chef/restaurant owners who are attending galas and leading lives similar to the ladies on the Real Housewives. I've just emailed my contact at the company saying that I don't think such wives exist. But I could be wrong. In my experience, the women married to non-famous chefs are usually working women and mothers. When I first started this blog in 2007 I was spending my weekend at restaurants and bars all over New York. Arm in arm with two other chef's girlfriends I was having the time of life and getting loads of PX treatment at some of the best places in the city. Four years and one baby later and I'm still spending my weekends at restaurants, it's just that those restaurants are kid friendly and dinner is around 5. Are you a Jill Zarin? Or more of a Ramona? If you are out there reading this blog and want your Real Housewives style life shown in a reality show send me a comment or email and I'll forward your information along to the production company. This company by the way is the same company that puts on Iron Chef and Iron Chef America so they are no strangers to food shows. It'd probably be a better show if it was about chef EX-wives (which I am)! 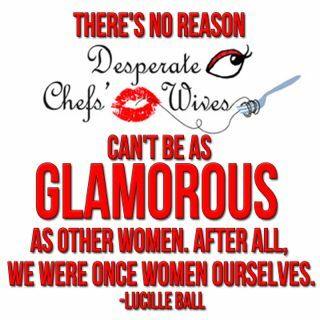 Besides, I think you're right, most chefwives are working women, and the galas become tiresome after you've gone to a few. My chef always abandoned me to go hang out with his other cool chef buddies and drink too much. It was like taking a little boy to a birthday party and dropping him off, yet he always insisted that I accompany him because he didn't want to show up alone. Only one of the many reasons I am now an ex-chefwife. It was truly sad but I think it's for the best. I would never watch a show glamorizing our lives. It would be a lie. There may be one or two out there-maybe, but it is not the true picture. It's amazing how misinformed people are about this industry. If it does come about, I hope it doesn't make it look like we're pampered, eating all this wonderful food... mac n' cheese for one is far from gourmet. my life as a chef-wife is far from glamorous! raising 2 kids by myself, dining and going to bed alone, attending major family events unaccompanied, and struggling with the financial woes of trying to run our first restaurant by ourselves. i think watching a show like that would just make me mad! The tv producers just need to read this blog and learn the truth about chefs and their wives. That's why I love this blog, it's real. Hahaha!!! Glamorous? Whatever. Newly married and while I count my blessings every day that we get weekends and nights together right now due to his hours but all those extra gigs add up so I am back to being on my own again. I love people who think we eat like goddesses all the time. Hello, I had Trader Joe's pizza last night. Fancy. If that woman exists out there I don't know if I want to know her, I might punch her. TV has really told the wrong story of chefs that's for sure, if they only knew the truth.... I love how all chef wives say the same thing.... mac n cheese for dinner anyone? Friend: "Oh, you're dating a chef? I'm so jealous, he must feed you soooo well!" Me: "What are you talking about? He works through every meal, then comes home at 1am. We share a kebab and watch a catch-up of that night's X-Factor until 4am." 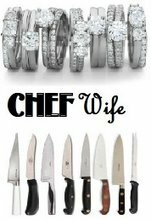 If there was a show about chefs' wives, it would just be two split screens of separate lives that intersect for 10% of a day. Iris, there is something so perfectly "chef" about kebobs and 4 AM X-Factor. The things we do just to be with them!! I could write a book! Oh, and Iris SO funny about the split screen. If I get another call from another production company I'll have to share that lovely image. BTW-nothing has come of the last dumbo who thought they could make a show about the wives. I'm a stay at home mother of 2 that never see's her chef husband and pretty much goes to all school funtions and activities alone. That has never even been invited to a gala...mcuhless attend to one. If they want that... Bring it on!